Get your scented candles and bath bombs ready, because February 9 is Read in The Bathtub Day! We know you’ve probably already got an attractive paperback you’ve been dying to find time to dip into, but if you need some suggestions, here’s a bathing bibliography to peruse. Why not start with the writer who set her novels in her hometown of Bath? Jane Austen actually hated the place, and her frustrations with its superficialities traipse into her novels as light satire. While maybe Persuasion is the novel to read in the tub since the characters take a two-day vacation to the seaside (close enough? ), our vote is for Emma, the lightest, sweetest, and most comic of all her books. Screenwriter, novelist, and blacklisted HUAC defier Dalton Trumbo wrote in the bathtub, typing away at a custom desk that straddled the tub. His anti-war novel Johnny Got His Gun is a little grim for a soothing soak, so we’ll recommend instead the biography Dalton Trumbo:Blacklisted Hollywood Radical about this extraordinary, contradictory, irrepressible man. Roman style baths, UV light dental treatments, lots and lots of yogurt, electrotherapy (i.e. getting zapped in the name of health), and something called "slapping massage" were a part of the meatless, no smoking, chew-your-food-forty-times regimen at the Battle Creek Sanitorium run by Dr. John Harvey Kellogg – the man who pioneered the corn flake. T. Coraghessan Boyle’s comic novel The Road To Wellville follows a group of sickly visitors – and Kellogg’s less health-minded business partners – as they endure, and rebel against, becoming "healthy". We’ve all stared at our feet at the far end of the tub, but only Frida Kahlo thought to make the autobiographical portrait Lo Que el Agua Me Dio (What the Water Gave Me) of that view. You can see more of her iconic surrealistic selfies in the book Frida: Viva la Vida, which intersperses biographical poems with her paintings, diary entries, and letters. All 340 pounds of President Taft probably never really got stuck in the bathtub, but he did travel with a custom made bathtub that fit four average people. That's the subject of just one of the Presidential poems in The President’s Stuck in the Bathtub. A mikvah is a female-only public bath where Orthodox Jewish women go to ritually cleanse themselves, but in Faye Kellerman’s detective novel The Ritual Bath, it’s the scene of a horrific assault, as a Baptist cop must enter an insulated Orthodox community to get to the bottom of the case. If you like sci-fi and fantasy, there’s Memoirs Found in a Bathtub by Polish sci-fi master grandmaster Stanisław Lem, an epistolary novel of a diary left behind after a Kafkaesque apocalypse. We’ve also got the deep-sea diving biopunk novel Starfish by marine biologist-turned-author Peter Watts, and the adventures of a genetically engineered fish woman in Reefsong by Carol Severance. And let's not forget The Pisces, a funny, quirky romance between a gal who keeps falling for the wrong dudes and a merman. Screenwriter, novelist, and memoirist Nora Ephron’s final book, I Feel Bad About My Neck, is a collection of witty yet poignant essays about mortality and the passing of things, including one’s own life. But it’s laugh-out-loud funny, and its joie de vivre is especially evident in an essay where she debates whether it’s worth it to spend an ungodly amount on her favorite lemon-scented bath oil, especially the way she glugs it into the tub. Are you a fan of the urgent and cosmic text on a bottle of Dr. Bronner’s Soap? Then try Saving the World From My Bathtub, A Celestine Prophecy-style allegory about an Angel Warrior who astrally projects herself into other dimensions from the comfort of her bathtub. We’re not really sure what this book is about, but at least your bottle of Dr. Bronner’s will have someone to talk to. So many more titles! The Blue Bath, Bathed in Prayer, Bathtub Admirals, The Werewolf in the Bathtub, The Pigeon Needs a Bath, Pity the Bathtub Its Forced Embrace of the Human Form, The Lawless Decade : Bullets, Broads & Bathtub Gin, Mom's Bathtub Reader, Around the World in a Bathtub—whew! If we keep going we're gonna get wrinkly fingers! So what are you going to read this Read in the Bathtub Day? Share it in the comments below! February 9 is Read in The Bathtub Day! 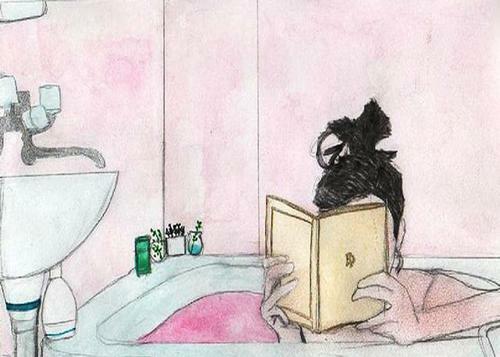 Add a Comment to Take a Deep Dive Into These Recommendations for Read in the Bathtub Day!